Female pattern baldness involves a specific pattern of hair loss in females, usually caused by hormones, aging, and genetic factors. This condition is also called female pattern alopecia and female baldness. The rate of hair growth is about 1/2 inch per month. The life of each hair includes cycles of growth and rest, which for scalp hair takes around 2 to 6 years ending with hair fall out. After the falling of hair a new hair grows in its place. In a normal person, 85 percent of hair is growing at any given time and the other 15 percent is resting. Baldness is a condition in which new hair does not grow when old hair falls or the new hair is miniaturized. The cause of this condition in female pattern baldness is not entirely understood, but it seems to be associated with genetic, hormonal changes and aging. Hormonal changes are commonly seen in the menopausal period when scalp hair is thinned, while facial hair grows coarser. The typical pattern in female pattern baldness is generally different from that of male pattern baldness. In female pattern baldness the hair thins out more but the front hairline maintains its look in most cases (unlike male pattern baldness with frontal recession). Female pattern baldness can occasionally appear similar to male pattern baldness, but it rarely progresses to full or even near total baldness as it may in men. Diffuse pattern of hair thinning over the entire scalp, often with more noticeable thinning toward the back. Diffuse thinning with more noticeable thinning in front, but with no involvement of the frontal hairline. 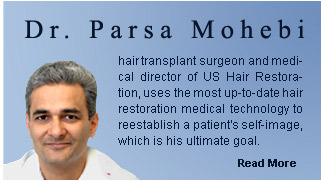 Patients in this group have the best result from hair transplant if they have an intact donor hair. Diffuse thinning with more noticeable thinning toward the front of the scalp with involvement and sometime breaching the frontal hairline. Diffused Unpatterned Alopecia (DUPA) in which hair becomes thin diffusely without following any specific pattern. These patients are generally not good candidates for hair transplant. Telogen effluvium - temporary shedding of hair at more than the usual rate. This is a common cause of hair loss for men and women. Accelerated hair loss after delivery of a baby is not uncommon. Alopecia areata - patchy areas of total hair loss (an immune disorder causing local hair loss). Scarring alopecia - patchy hair loss due to infection, inflammation or injury which is then followed by scarring. Trichotillomania - compulsive pulling of hair due to anxiety or other psychological issues. Some skin disorders such as lupus. Prior to treating hair loss, all common treatable causes have to be excluded. A simple lab test can exclude many of these disorders. Rogaine (topical Minoxidil 2%) is often the first step in medical treatment of these patients. Rogaine is the only FDA approved medication that is currently available for medical treatment for female hair loss. The other FDA approved hair loss treatment in males, Propecia, does not show any positive results in women. Other hormonal treatments have shown some results especially in women after menopause. Hair transplant surgery gives great results; however, many women with female pattern baldness are not good candidates for hair transplant because the donor hair area is also involved with the process of the baldness and hair miniaturization.